Gehwol Fusskraft Mint makes your feet fresh and fit, before or after an active day. It combines the revitalising icy freshness of a cooling mint lotion composed of an Asian medicinal plant oil with the gentle caring effect of a balm that is immediately absorbed. Natural menthol, essential oils from rosemary, mountain pine and lavedner refresh and strengthen tired and aching feet instantly. 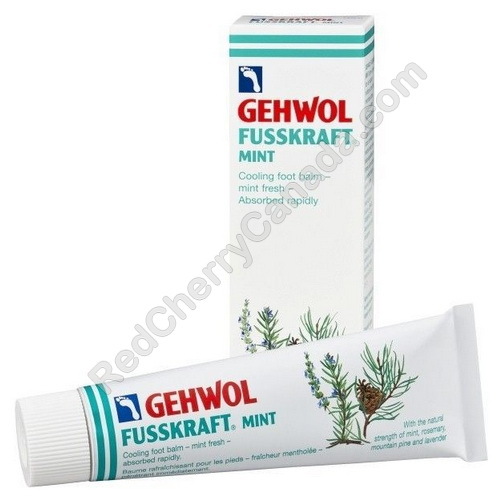 Gehwol Fusskraft Mint provides long-lasting protection against foot odour. Well-tired antiseptics prevent athlete's foot and itching between the toes. Thinly spread the cream on your feet and legs and gently rub in. It is quickly absorbed, non-greasing, refreshes and gives you the feeling of having clean and supple feet. Massage 1-2 cm of the cream into the feet daily. Do not store above 25 degrees celcius. Natural strength for feet: tired feet are given a new lease of life!